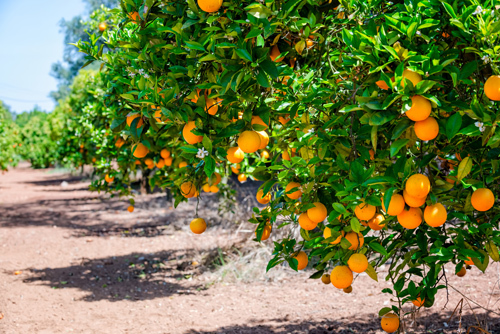 Land and water resources are both critical to agriculture in the San Joaquin Valley and other Mediterranean climates in California. These resources are under pressure from a variety of factors that have the potential to significantly affect the food production capacity of a region essential to the food security of the state, nation and the world. The most significant challenges include water supply, climate change, soil impairment, urban development, and environmental factors such as in-stream water needs. American Farmland Trust has partnered with the Conservation Biology Institute (CBI) , creator of Data Basin, to conduct a spatial analysis to determine where agricultural land and water resources are most at risk from these challenges. Understanding how and where water supply shortages, soil impairment, urban growth or climatic changes may impact agriculture will contribute to the discussion of strategies for agricultural adaptation and conservation in the Valley. This project will build on CBI's successful effort to identify areas where large-scale solar energy projects sited in the Valley would pose the least conflict with agricultural and environmental values (A Path Forward). As with the solar project, spatial analysis will occur at a broad Valley wide level. A number of scenarios, representing different assumptions about physical and policy trends, will be done to further enrich our understanding of the future prospects of valley agriculture. Input from technical experts and regional stakeholders will be sought throughout the process to help determine how to rank resource risks and values, and to help formulate future scenarios. We are now actively recruiting valley stakeholders to participate in the process through in-person meetings and on-line webinars. The ultimate goal of the project is to encourage and inform a purposeful regional conversation about strategies that will be needed to meet the region’s land and water resource management challenges and, thus, assure a productive and prosperous future for San Joaquin Valley agriculture. Currently we are finalizing our report for this project, which should be ready in Summer 2018. 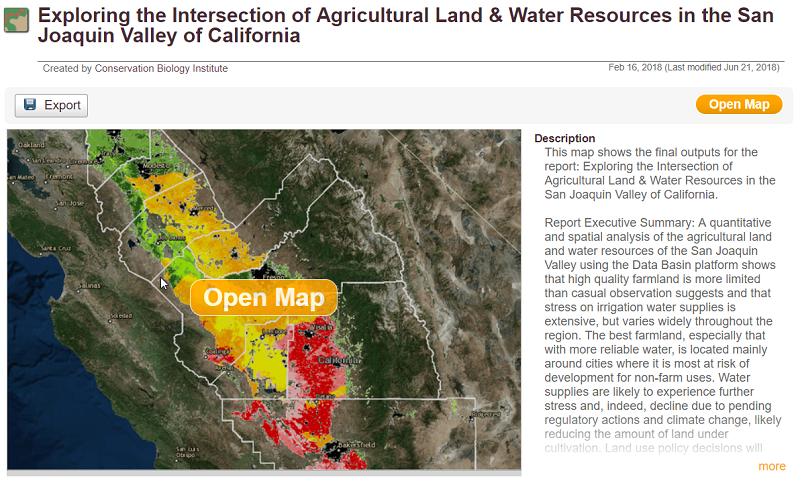 Our final analyses and data inputs are available on the San Joaquin Valley Gateway in the map and gallery linked above under the Explore Related Items section. You can also go directly into the map by clicking on the image below. Please visit back soon or contact us below to find out more information about the project.